Another milestone in the countdown to polling day has arrived, which means it’s time for another prediction of the election result. It’ll come as no great surprise to see I’m still expecting a hung parliament. But the gap between Labour and the Tories has widened slightly since last month’s prediction. I’m now suggesting Labour will win 305 seats (up 47 on the 2010 result), the Tories will win 278 (down 28), the Lib Dems will get 38 (down 19) and the others – including the Speaker – will be unchanged on 29. Last month’s prediction had a four-seat gap between Labour and the Conservatives; this month it is 27. I’ve bumped up the number of seats I think Labour are likely to win from the Tories, in part because of ongoing trends in the polls, in part because I think I was somewhat over-cautious with my forecast in July. I’m now persuaded, for instance, that Labour will win the likes of Warwickshire North – the retirement of sitting MP Dan Byles being the key reason – along with other ultra-marginals like Sherwood and Waveney. I continue to think, however, that the sort of result implied by the latest poll trends (a Labour majority government) will not be borne out on polling day. The presence of Ukip will disrupt what would otherwise be conventional two-party swings between Labour and the Tories. This could both hurt and help Miliband and Cameron in different ways, but overall will conspire to deny Labour enough gains for an absolute majority over all other parties. I still maintain that Ukip will not win any seats outright. Based on my prediction, a Tory-Lib Dem coalition would total 316 seats: 10 short of an absolute majority in parliament. 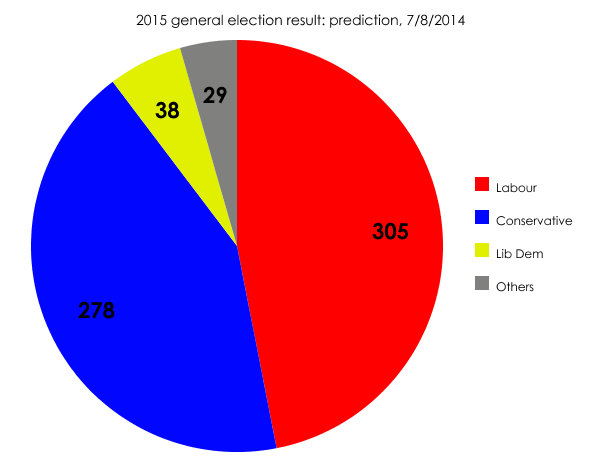 A Labour-Lib Dem coalition would total 343 seats: 17 above the magic figure of 326. From the Tories: Warwickshire North, Hendon, Cardiff North, Sherwood, Stockton South, Lancaster & Fleetwood, Broxtowe, Amber Valley, Wolverhampton South West, Waveney, Carlisle, Morecambe & Lunesdale, Weaver Vale, Lincoln, Plymouth Sutton & Devonport, Stroud, Brighton Kemptown, Bedford, Dewsbury, Warrington South, Pudsey, Enfield North, Hove, Northampton North, Brentford & Isleworth, Nuneaton, Ipswich, Bury North, Gloucester, Wirral West, Croydon Central, Harrow East, Ealing Central & Acton, Norwich North, Ilford North and Finchley & Golders Green (total = 36). From the Lib Dems: Solihull, Dorset Mid & Poole North, Wells, St Austell & Newquay, Somerton & Frome, St Ives, Chippenham and Cornwall North.